About 2:30am yesterday, we sailed into the Chesapeake Bay. This is our summer destination. We are extremely excited with the offerings of the bay particularly the picturesque small towns, bay front cities and isolated tree lined coves for which the Chesapeake is renowned. We tried to time our entrance into the bay at dawn. But for once, the wind Gods dealt us favorable winds. In fact, the three days it took for us to sail here were the best days of sailing we have ever had sailing Cream Puff. As part of trying to time our arrival, we left Beaufort, NC at about noon. We also wanted to leave at a slack tide as this makes getting out of the marina much less dramatic. Beaufort has some strong currents. Lack of current also helps to keep the waves over the sand bars at the ocean inlet to minimum. During our entrance we observed firsthand how choppy this inlet can be. And besides, it gave us the chance to have a nice breakfast and enjoy a leisurely start to our day. When checking out of the marina, they asked which way we were heading. I told them we planned to round Cape Hatteras and onward to the Chesapeake Bay. Whenever we mention rounding Cape Hatteras to another sailor we get the look of concern and the usual words of empathy. This time we were offered some advice to safely round Hatteras; take the bus. We headed south retracing our path so we could round Cape Lookout. Once around the cape we pointed northward and headed for the dreaded Cape Hatteras. Throughout our trip north up the east coast, the thought of rounding Cape Hatteras has been nagging me. I will admit I was apprehensive about this leg of our journey. Why? Perhaps because almost every time I read about the Coast Guard rescuing someone from a sailboat the location was given with a reference to Cape Hatteras. The vessel called Mayday (fill in the blank) miles off Cape Hatteras. Cape Hatteras is a point where the south flowing Labrador currents meets the north flowing Gulf Stream current causing what we now refer to as roly-poly seas. From the cape, Diamond Shoals forces vessels to push out seaward by more than 10 miles to avoid treacherous shallow waters. Hatteras is also where stormy weather systems form to begin storms that travel clear across the Atlantic Ocean. Hatteras also boasts the most hurricane strikes of any American land point. Fun place to sail, huh? We safely rounded Hatteras on our first night out. Sleeping was tough due to roly-poly seas. It also rained a little. But not to worry, we had plenty of time to sleep in the calmer waters north of the cape. Once north of Cape Hatteras, seas were a calm 2-3 feet, 15 knot winds made for a broad reach (coming from the eight o’clock direction in relation to the boat). In this weather, Cream Puff sails perfectly upright and at a comfortable 6 knots. There were times when I was napping I forgot we were actually sailing. 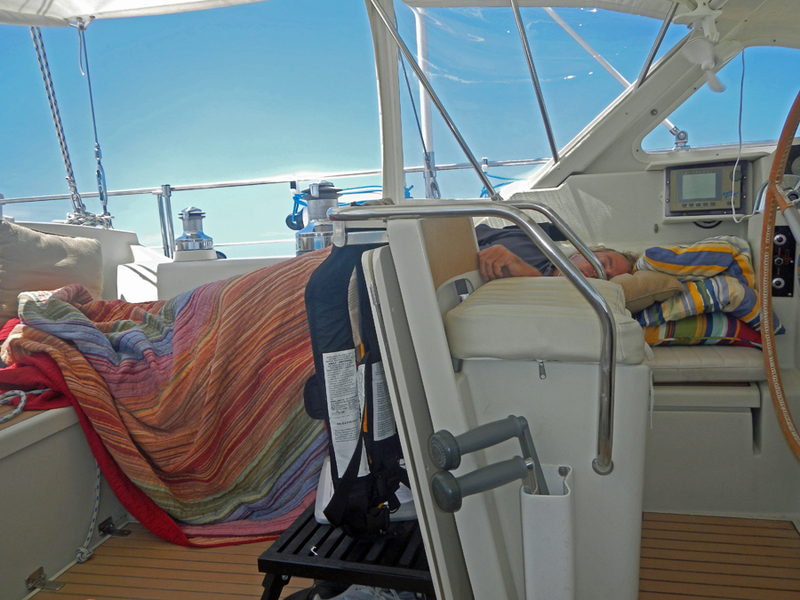 Taking advantage of calm seas – Nap time! We arrived at the Chesapeake Bay early because of the favorable winds. This meant entering the channel at night using radar, AIS, chart plotters and nerves of steel as the area is heavily trafficked by large tankers. When crossing these shipping lanes, it is like crossing a busy city street. Look left, look right, look again, okay, hold on, here we go, hurry up. We really wanted to see the bridge tunnel spanning the entrance in the daylight as it is very cool. It would also have been nice to see ship traffic in the daylight rather than depend on instruments. Under moonlight, the bridge tunnel was no less impressive. 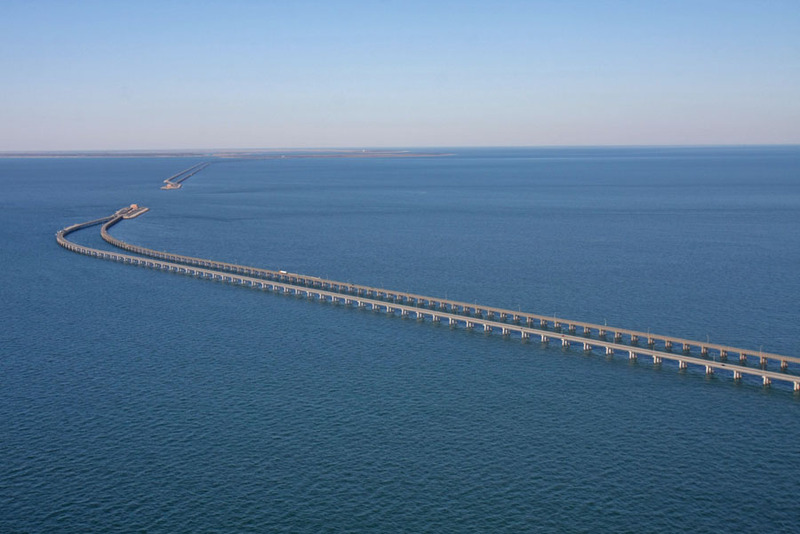 This 1960’s feat of engineering replaced the old ferries crossing between the two shores of between Southeastern Virginia and the Delmarva Peninsula where the Chesapeake Bay meets the Atlantic Ocean. We timed our transit over the tunnel to avoid any close encounters with ship traffic. Even better, we didn’t need to start the engine. We truly sailed into Chesapeake Bay. Here is a link to the cbbt web page for details and history on the bridge tunnel. We continued to sail northward further into the bay and as the sun came up we got our first glance of the shoreline. I use shoreline as a singular since we could not see the other side. This bay is huge. By midday, our third day of sailing, we were pretty pooped. Pooped is in fact an understatement. “Hitting the wall”, was the phrase used. We decided to pull over and anchor. This is another first for us. We have always had set destinations. This is the first time since cruising we could say, let’s just stop here and spend the night. 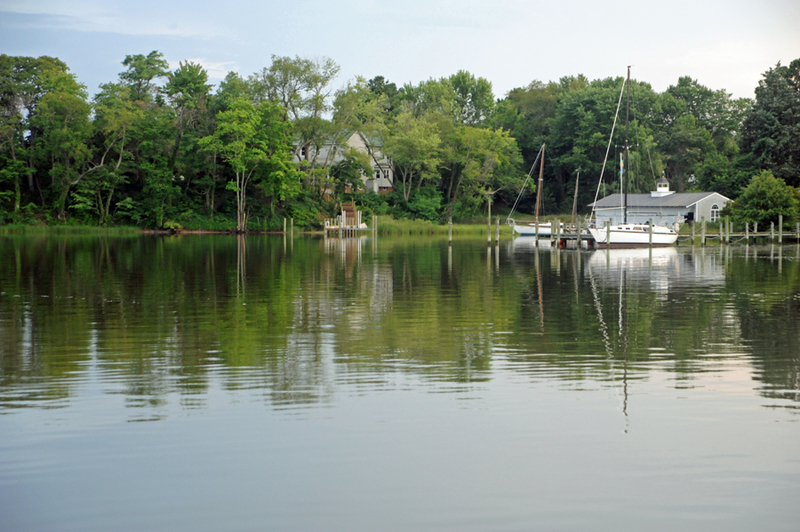 We looked at the charts and picked out a spot just a little way up the Great Wicomico River called Sandy Point. This is where we spent our first night on the bay. This ended our trek of almost 1400 nautical miles (1611 miles) since leaving St Petersburg FL. An interesting observation; Looking at a road map, Sandy Point is located at the end of SR 666. Is it just me or do you also think something a little more creative than Sandy Point should have been used as a name? I was thinking more in the line of Devil’s Cove or Satin’s Shore. We awoke this morning to the sound of nothing except for the birds singing. The water is dead calm and there is a slight cool breeze. Over a cup of English Breakfast Tea, we decided to do nothing today. Absolutely nothing! 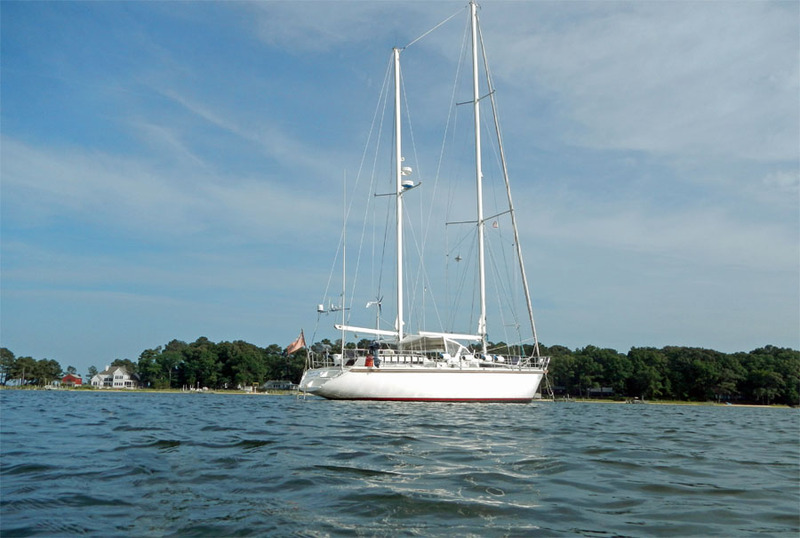 We have about 3 months here gunkholing about finding the hidden treasures of the Chesapeake area before heading south to the Caribbean in the fall. Today we are both smiling and wondering what lies in the days ahead.